Oil on canvas, 21 x 30 cm. 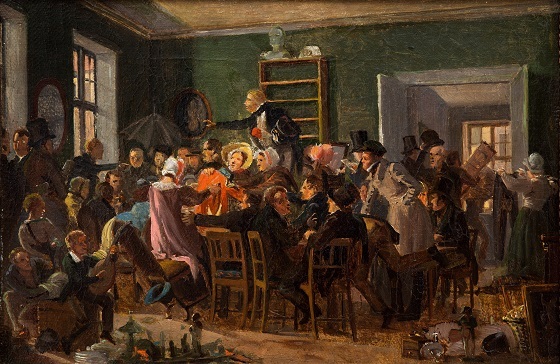 Taking a humorous approach with this work, Marstrand has depicted an auction in Copenhagen as a hysterical and somewhat caricatured spectacle. At the centre of the composition is a group of ladies feverishly pulling at a red tunic to get a closer look, while all but one of the husbands are sitting back and watching their wives go at it. Rising above the fray – literally – is the auctioneer, trying in vain to address the motley assembly while a group of gentlemen are leaving with the day’s purchase. This sketch shows that even at an early point in his career, the artist had a knack for effortlessly depicting crowd scenes. The year after the completion of this work, Marstrand embarked upon his first journey to Italy, where he found ample opportunity to depict more such droll scenes in a South European setting.